Staff available to help you! Not all services available every Tuesday. 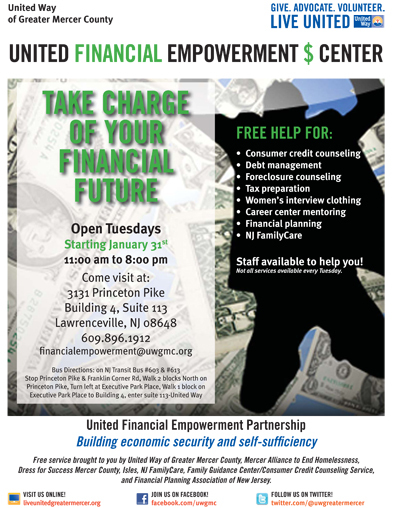 Free service brought to you by United Way of Greater Mercer County, Mercer Alliance to End Homelessness, Dress for Success Mercer County, Isles, NJ FamilyCare, Family Guidance Center/Consumer Credit Counseling Service, and Financial Planning Association of New Jersey. Claim your hard earned money for FREE!